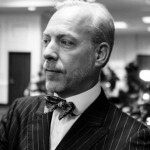 Jeffrey Tucker: Bitcoin Is Replacing Precious Metals As Safe Haven - Wall St. for Main St.Wall St. for Main St.
Wall St for Main St interviewed Jeffrey Tucker, who is the Chief Liberty Officer and Founder of Liberty.me. In this podcast, we discussed the growing popularity of Bitcoin and he thinks Bitcoin will replace gold/silver as the safe haven for Main Street. We also talked about the debate of minimum wage, income inequality, his article on Donald Trump that went viral and much more!